For some, peanut butter is a staple in the house. It’s the better half of a classic PB&J. It’s a sticky addition to a bowl of oatmeal. It’s the perfect dip for celery sticks— or just right off the ole’ spoon. However, for some families, peanuts are on the no-fly list. If someone in your house has a peanut allergy, it means they can’t even come in contact with scrumptious legume. When you have a baby, introducing them to peanuts for the very first time can be scary. Not to worry, below are some of the most commonly asked questions on the introduction of peanuts. When do I start giving my babe peanuts? There is a lot of fear surrounding the introduction of peanuts. Peanuts are one of the most common— and severe— food allergies, so the fear is understandable. Historically, parents have been told to wait until around 1 year before introducing peanuts to a baby. However, between 1997 and 2008, the number of children with peanut allergies almost tripled. This lead to a new wave of research that focused on the idea that maybe the reason why peanut allergies were becoming more common was because we were waiting so long to introduce them to begin with. Nowadays, it’s recommended that parents introduce peanuts to their little one at as early as 6 months, in an effort to increase tolerance— and therefore reduce the number of children with peanut allergies. Still, the thought that your child could have a peanut allergy makes its introduction extremely intimidating for parents. Does anyone in your family have a peanut allergy? If not, your child likely won’t have an allergic reaction to peanuts. If there is a history of peanut allergies in your family, have a discussion with your child’s pediatrician to determine the best way to go about introducing peanuts. Go to the doctor. Most pediatricians don’t mind if you bring in a closed container with peanut butter, or peanut butter cereal to your little one’s check up. This way, you can give your baby their first taste of peanuts right in front of their pediatrician. If your pediatrician is willing, it’s a great way to provide peace of mind for you knowing that in the event that an adverse reaction occurs, you’re already right where you need to be. It is estimated that 0.6-1.3% of people in the US have peanut allergies. That means that there is a very small chance that your babe will be one of those with a severe peanut allergy. Take a deep breath— it’s all going to be okay. How do I introduce peanuts to my babe? Mix peanut butter or peanut butter powder in with your babe’s cereal, oatmeal, apple sauce or other fruit puree. Peanut powder is particularly great, because it’s easier to start with very small quantities and control how much you’re adding in. What about all of the other nut butters I see at the store? Move over peanut butter. 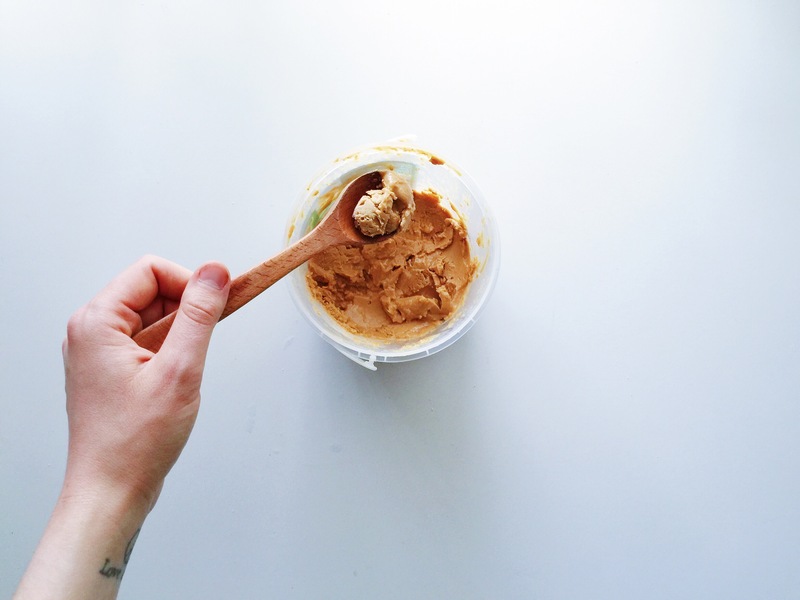 These days, there are tons of nut butter options on the market. On a trip to your local health market, you can find cashew butter, almond butter, macadamia nut butter, sunflower butter— and more. Try what you’re comfortable with. From a health perspective, the most important thing is that you find natural nut butters with no added sugar. From an allergy perspective, walnuts, almonds, hazelnuts, cashews, pistachios and Brazil nuts all qualify as tree nuts. Tree nuts are a different food allergy than peanuts— but can be just as severe. Similar to peanut allergies, the research is changing with regard to when to introduce tree nuts to babies. You can introduce them as early as 4-6 months. But ultimately, it’s up to you! Do whatever makes you feel most comfortable. My little one loves peanut butter – but they attend a nut-free school. What are alternatives?